1. The Tikvah children's home and school began operations in the mid-1990's under the direction of the Ohr Somayach outreach organization. Although independent today, the Tikvah complex continues to function according to a philosophy similar to that of Ohr Somayach under the supervision of Rabbi Shlomo Baksht. Unfortunately, because no Tikvah official was in the city during the time of the writer's visit, she was unable to observe any of their programs. The Tikvah school occupies five different buildings, each assigned to a specific age/gender group. Enrollment at the elementary school level is about 200 youngsters, and approximately 270 attend the Tikvah high school, including a small group of teens with learning disabilities and/or academic delays in a vocational studies program. Another 250 children attend a Tikvah preschool and kindergarten. About half of the pupils in the elementary and secondary schools are residents of the Tikvah homes. The dominant group among the other half are children from underprivileged families in the city of Odesa. Tikvah operates the largest residential program for Jewish children in Ukraine, accommodating several hundred youngsters in separate facilities for boys and for girls. The majority of these youngsters are known as social orphans. Social orphans lack status as orphans as defined by law because one or both parents is alive; however, the parents are deemed incapable of raising children due to mental illness, chronic physical illness, addictions, imprisonment, or other issues. In some cases, a grandparent may be a legal guardian, but is unable to provide adequate care due to advanced age and related concerns. 2. The Chabad Ohr Avner day school enrolls approximately 320 youngsters, a steep decline from the 500 who were enrolled at the time of the writer's last visit in 2009. Approximately 120 children in nursery school through grade four meet in one building, and the remaining 200 in grades five through 11 are taught in a separate structure. The Jewish studies component in their curriculum includes three weekly lessons in Hebrew and another three in a combination of Jewish tradition, history, music, and art. Approximately 40 boys attend a discrete heder in classrooms on the lower floors of a new building that also accommodates 24 boys in a residential program. Fundraising currently is underway for a new building for 25 girls who require dormitory space; the girls currently live in an older structure that is inadequate for their needs. Chaya Wolf, wife of Chabad Chief Rabbi Avrum Wolf, stated that about 40 percent of youngsters residing in dormitories are from Odesa; the remainder have been referred by rabbis in nearby Mykolaev and Kherson, as well as more distant Kyiv and Poltava. 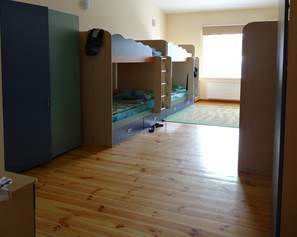 Modern dormitory rooms accommodate eight boys in a single room with an adjoining small bathroom. Large lockers (with green and blue doors in photo) and drawers below bunk beds hold clothing. The building includes a computer room and recreational premises. The day school, said Mrs. Wolf, is private and charges each student $15 monthly, although the real cost is about $450 monthly. Eleven buses transport youngsters between home and school. 3. School #94, a public school sponsored by ORT, currently enrolls about 400 youngsters in grades one through eleven in a building with a capacity of 450. The student census usually declines at the high school level, said Principal Svetlana Manchenko, because a number of pupils transfer into the Na'aleh high school in Israel program at the beginning of tenth grade. 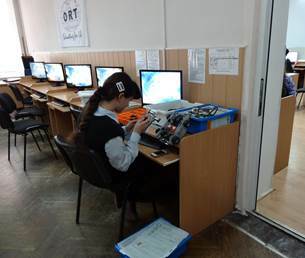 Depending on grade level, the ORT school curriculum includes three to five technology classes every week; students preparing for competitions with the other 16 ORT schools in the post-Soviet states often participate in afterschool computer activity as well.The technology curriculum includes work in robotics and animation. The girl in the photo at right is preparing for an interschool competition in robotics.Some competitions take place online, but others involve travel to ORT schools in different post-Soviet cities and even in Israel. The Jewish studies component of the ORT school includes 180 class periods each year, a total that includes Hebrew language, Jewish tradition, and Jewish history. Additionally, School #94 conducts a brief Kabbalat Shabbat (welcoming the Sabbath) ritual every Friday afternoon and observes all Jewish and Israeli holidays. Reflecting the legacy of the Holocaust in Odesa, commemoration of the Holocaust is an important part of the curriculum. Ms. Manchenko stated that graduates who remain in Odesa attend a broad range of Odesa post-secondary educational institutions, including those that are the most prestigious.She mentioned technological and medical colleges, pedagogical colleges, and institutes that prepare young people for careers in the merchant marine field. Several observers with whom the writer conferred stated that School #94 is the most academically rigorous of the three Jewish day schools in the city, but that it is far from being the best school in Odesa. Notwithstanding its technology focus, said one individual familiar with Odesa schools, families can find other public schools with more comprehensive technology programs and more advanced technology equipment. 4. In addition to Jewish day schools, Odesa is home to two Jewish quasi-universities sponsored by rabbis. Odesa Jewish University was opened in 2003 by Rabbi Shlomo Baksht and Southern Ukraine Jewish University was established several years later by Chabad Rabbi Avrum Wolf.Students in each institution pursue a double course of studies, enrolling in both compulsory religious classes and in a secular academic program that leads to a conventional academic certificate or degree. Reflecting small enrollments - 100 to 150 students in each institution - the number of academic majors is severely limited; professors from accredited local colleges teach secular classes in such areas as pedagogy, speech therapy, business, and computer technology. Each rabbi provides instruction, dormitory accommodations, and meals free of charge. Additionally, students receive a small stipend. The classes in Odesa Jewish University meet in a large hall and several smaller rooms above Rabbi Baksht's synagogue prayer hall, whereas the Chabad institution convenes in a rented building. Two of the major features of these programs - low academic standards for admission and cost-free degrees - compensate for a third feature that some find disagreeable, the requirement that students attend several hours daily of religious classes as well as prayer services. 5. The Odesa Hillel student group contains 700 names in its data base, said director Pavel Vugelman. Approximately 150 students of this total constitute an active core group, regularly participating in a variety of Hillel programs, a number of which operate as clubs. For example, two of the most popular are Jewish tradition in a pluralistic sense and Jewish history, the latter emphasizing the rich history of Odesa Jewry. A Hillel women's club, he continued, meets jointly with the local Project Kesher women's group. Hillel has sponsored a strong intellectual games (Jewish trivia) cohort since its inception in the 1990's. Its own six-player teams compete with similar teams from Hillels in other cities in a tournament in Odesa every May, stated Mr. Vugelman; accompanying the competitions are tours around Odesa. Hillel also organized two Taglit (birthright Israel) buses in 2012, each with 40 people. A website focusing on Tikvah can be accessed at http://www.tikvaodessa.org. See also an account of the writer's 2009 visit to Tikvah facilities in her A Spring Visit to Ukraine - March-April 2009, pages 12-14. As a seaport, Odesa is home to a number of marine-related academies, most of which are related to commercial seafaring, rather than military service. Young people in marine cadet uniforms are visible in several areas of the city. Typically, these programs attract poorly prepared students from Jewish day schools and from low-standard public schools in smaller cities and towns. The writer met two former students who described these institutions as offering pathways out of the bleak small towns in which they were born; they found the atmosphere of the Jewish universities to be insular and depressing - and each transferred to a secular institution as soon as he was able to do so. Nonetheless, they acknowledged the limitations of their small-town secondary schools and were grateful to the Jewish institutions for providing the initial opportunity to leave their dreary towns and acquire the tools for productive lives elsewhere. After enrolling in their respective secular institutions, each had sought out secular Jewish organizations for socializing and each was planning to emigrate to Israel. Project Kesher is a Jewish women's group that is active in Russia, Ukraine, Belarus, and several other countries that once were republics of the former Soviet Union. It also works in Israel. Project Kesher promotes women's leadership development, Jewish education, women's health, and several other concerns.